Crackles are my pride and joy. It's a unique recipe that I've been perfecting for over 30 years. I take specially selected rind and triple cook it to golden perfection to get the delicious, mouth-watering taste that I know you love. My porky snacks are the nation's favourite and will satisfy your craving anytime, anywhere. Store in a cool, dry place away from bright lights and strong odours., Once open, consume immediately. 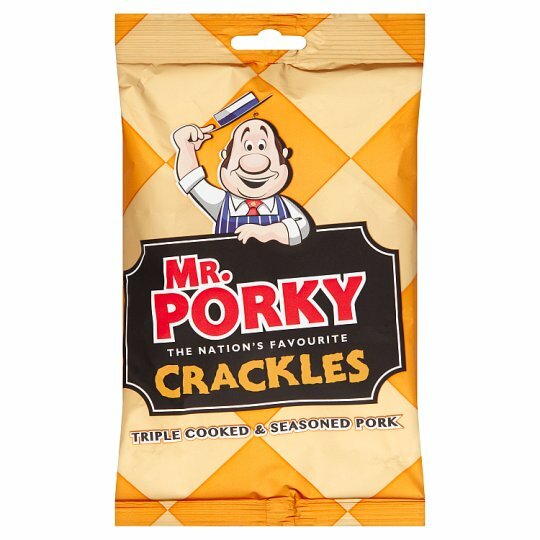 Mr. Porky's Pledge: Mr. Porky is proud of his delicious pork snacks and wants you to enjoy them too. If you are not satisfied, please write to the Consumer Services Department, remember to enclose this bag & its contents. Your statutory rights are not affected. WARNING: Only recommended for people with strong healthy teeth. Although every care has been taken to remove bones, some may remain.